we are sent to work for peace, justice and love in our communities and world. 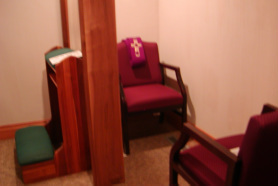 "The Sacrament of Reconciliation: Celebrating God's Forgiveness"
"Reconciliation: An Experience of Forgiveness"
What's the difference between Confession and Reconciliation? Is Confession based on the Bible? Is Confession by e-mail allowed? Because of human weakness, the new life in Christ which we receive in the Sacraments of Initiation, is often threatened by sin. God constantly reaches out to us to reconcile ourselves to him. Through the gifts of the Church, Jesus, our divine physician, has given us the Sacrament of Reconciliation - for the forgiveness of sins. In this Sacrament, the priest acts in the person of Christ, the Head of the Church, to reconcile the sinner to both God and the Church. When he celebrates this Sacrament, the priest is fulfilling the ministry of the Good Shpherd who seeks the lost sheep...the priest is the sign and instrument of God's merciful love for the sinner. The Sacrament of Penance is an experience of the gift of God's boundless mercy. Not only does it free us from our sins but it also challenges us to have the same kind of compassion and forgiveness for those who sin against us. We are liberated to be forgivers. In order to be forgiven, we need to have sorrow for our sins. This means turning away from evil and turning to God. It includes the determination to avoid such sins in the future. We are asked to look into our souls and, with an honest and unblinking gaze, identify our sins. In confession, by naming our sins before the priest, who represents Christ, we face our failings more honestly and accept responssibility for our sins. When we have examined our consciences and have taken responsibility for our sins, we then confess them to the priest. After we confess our sins to the priest, we are given some encouragement from the priest for our moral and spiritual growth. The priest then gives us a penance and asks us to say an Act of Contrition. Then the priest grants absolution, that is, he sets us free from our sins, using the power that Christ entrusted to the Church. 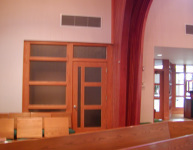 Reconcilation room is in the back of church, to the right as you enter. always been two essentials: the acts of the penitent and the acts of Christ through the ministry of the Church. Both go hand in hand. Conversion must involve a change of heart as well as a change of actions. Neither is possible without God's grace.